Cinema and theater owners have taken a leaf out of Netflix style subscription services by offering their own unique service you cannot watch online. A new service called MoviePass, costing $50 monthly lets subscribers walk in to theaters and watch as many movies as they like. The subscription service runs on users smartphones via a HTML5 app that lets you reserve your seat and get your ticket with a wave of the phone. Viewers can then order the DVD or digital download to complete their evening. The service is quite a cost at $50 every month, MoviePass are said to be looking at different price points and also additional services for 3D and IMAX movie theaters. 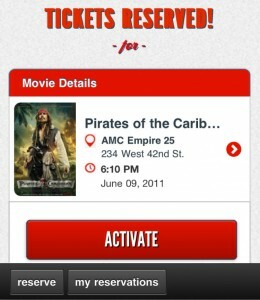 The service starts in private beta in 21 theaters in the San Francisco Bay Area. The service will (if successfull) launch further within the US during the summer and MoviePass plan to be working in 40% of screens in the fall when it is fully launched. More details on MoviePass.